Geothermal heating and cooling systems are quickly becoming popular alternatives in the construction of new homes. It should be noted though that this is not a new technology and in fact has been around since the late 1940’s (USDE). When considering what has changed in the realm of this technology, current gas furnaces can increase household energy efficiency by 30% while similar geothermal heating/cooling systems can increase energy efficiency by up to 50% (Flietner). This is all well and good, but how does a geothermal system work? The average year-round temperature of the earth at a depth of ten feet is between fifty and sixty degrees Fahrenheit worldwide (Flietner). This allows pipes to be buried at that ten-foot depth, which are typically filed with a non-toxic water/anti-freeze solution. From there the solution is circulated to a heat pump, which replaces the furnace with a system very similar to the heater found in an automobile. After the solution has passed into the heat pump the solution is heated to a temperature of about one hundred degrees Fahrenheit. 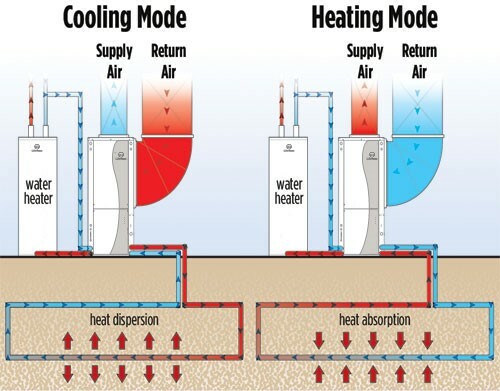 This process turns the solution from a liquid into a gas and passes it through a heat exchanger, where ambient air around the exchanger is heated and then circulated throughout the house. The process for cooling operates in much the same as the heating process save that the coolant is not heated. Instead, the solution passes through the heat exchanger at approximately fifty degrees, cooling ambient air, which is then circulated throughout the house. The operational process of geothermal heating/cooling is by its very nature less energy intensive than traditional gas furnaces. Current geothermal heating/cooling systems can also be applied to hot water heating in a clean little package. Currently four geothermal loop systems that are used, though only two of these are practical for residential use. The Pond/Lake loop system, as is used at Sherman Hospital in Elgin, requires a significant amount of water that is at least eight feet deep to prevent freezing in the winter (USDE). This particular application of geothermal heating/cooling is best for industrial applications given the amount of land require for the system to work efficiently. It is possible that this system could be used on a large scale to provide for an entire community. While this process would be the easiest to do for a new community, it is conceivable that the system could be modified to use existing ponds or even wetlands. 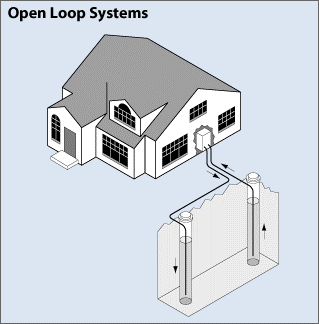 The Open Loop System on the other hand can be used in a residential application. This system relies on the use of groundwater instead of the anti-freeze/water solution used in typical systems (USDE). Therein lies the difficulty in implementing this type of system, for it requires access to a source of clean ground water. This factor alone makes this system one that is not commonly used. That leaves us with the Closed Loop System for residential application. This system comes in two varieties, vertical and horizontal. Horizontal loop systems are typically cheaper on the installation side as the pipes can be spread out in trenches as little as four feet in depth (USDE). Vertical systems on the other hand are commonly used in areas where the residence lacks the land for a horizontal system. This requires that holes be drilled between one hundred to four hundred feet deep in order to accommodate the needs of the home (USDE). 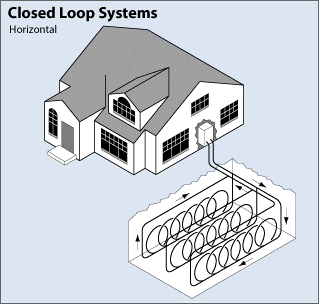 The vertical loop systems can prove to be substantially more expensive than horizontal system for the same home. When it comes to the installation of a geothermal heating/cooling system, the costs can vary greatly from region to region. The amount of land the homeowner has available will affect whether they can use a horizontal system or if they will be required to use a vertical system. The physical characteristics of the land itself is another factor to take into consideration. If the land has a high water table the costs will be greater as water has to be pumped out of the ground until they get the pipe laid and buried. If the soil is extremely rocky or is they hit an underground rock formation prices can escalate quickly. The best thing a homeowner can do is look at average prices for installation. Right now the average price for parts and installation of a geothermal heating/cooling system in a 2,500 sq. ft. home is an average of $34,000 for a 6 ton vertical loop system (Energy Homes). This may seem like a lot of money to spend on a new heating/cooling system for ones home, but the annual savings and tax incentives will more than offset the cost of installation. There is currently a federal tax credit of 30% for the installation of geothermal systems (Energy Homes). This brings that $34,000 down to a net cost of $20,650 just for installing the system (Ibid). Things get even better considering the efficiency of the system can net an average savings of $130 per month of utility fees, bringing the saving to as much as $1,560 per year. If prices were to remain constant a homeowner could pay of the cost of installation in as little as thirteen years with the money they saved from the cost of utilities. There are a number of other tax incentives as well, that vary by state. While Illinois has been slow to expand tax incentives for geothermal systems, there are still a number of incentives to be had. The “Efficient Living Energy Grant” for example, offers up to $350,000 for the implementation of geothermal heat systems in low-income PHAs (DSIRE). Other states like North Carolina are offering subsidized loans with a finance rate of 5% over a sixty-month period. Iowa is offering an additional 6% on top of the federal 30% tax incentive for the installation of geothermal systems (Ibid). Looking at other states gives some idea of what kind of credits and incentives could eventually find their way to Illinois. The cost of geothermal heating/cooling system may seem daunting upon first inspection, but the savings and incentives offered greatly offset the cost of installation. The idea here is that there are options other than natural gas for space heating, which are much cheaper in the long term. Imagine cutting national energy consumption by 50%. That thought alone should be enough to make the move toward geothermal heating/cooling and other energy efficient systems in residential areas.